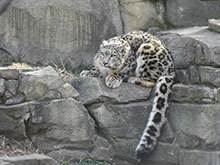 The Milwaukee County Zoo is pleased to announce the public debut of a female snow leopard, Orya, from Zoo Zurich in Switzerland. 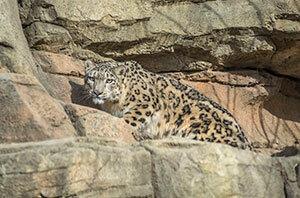 Orya is the second of two snow leopards acquired by the Zoo as a result of the Greater Milwaukee Foundation’s Gifts to the Community, a program that offers special opportunities and experiences throughout the region. The first snow leopard, male Asa, came to the Milwaukee County Zoo in 2015 from the Rosamond Gifford Zoo in Syracuse. Orya arrived here last summer, and it is the Milwaukee County Zoo’s hope she’ll find a “spot” in her heart for Asa and they’ll eventually breed. At Zoo Zurich, Orya was very close with her twin sister, Okara. Keepers report that of the two siblings, Orya was a bit braver and more curious – often exploring new enrichment items and foods before Okara would investigate them. Orya was quite trusting toward keepers at Zoo Zurich, but became rather shy once Okara was transferred to a zoo in Poland. Slowly she began to regain her confidence, but it has taken a bit of time for Orya to acclimate to her new environment at the Milwaukee County Zoo. Her former keepers report that eventually she became more open and friendly at Zoo Zurich, commonly approaching the fence to greet zookeepers. Zookeepers here at the Milwaukee County Zoo relay that Orya continues to acclimate to her surroundings at the Florence Mila Borchert Big Cat County. They’ve watched Orya playing with enrichment items, such as tubs of water and paper bags, from a distance – and recently she’s started to become more comfortable and even interact with keepers. Orya’s mother, Dshamilja, was born in the wild, but was captured in a poacher’s trap when she was only 4 months old. Although she lost part of her hind foot during the incident, a German conservation organization and local authorities later arrested the poacher and acquired Dshamilja. From there, she was donated to the European Endangered Species Programme (EEP), and has raised six litters since becoming part of the zoo population. Orya and Okara are her last offspring, as Dshamilja is now 16 years old.